Unfortunately, for this DVD release, Warners has not deigned to restore Kaige's film to its original length, allowing those of us who have not sought out the import version the chance to make up our own minds whether or not The Promise was helped or hindered by corporate interference. Except they kind of have. The twenty-two missing minutes are on this disc as "additional scenes," complete with ridiculous title cards where some studio tool explains why each of the seven sequences was cut. Would it have been so much trouble to give us the "extended" version? Unrated, longer cuts are all the rage in DVD marketing, after all. Why not give us both versions on one disc and let us make up our minds? Or at least use some branching technology to have the scenes inserted back in where they belong if the viewer so desires. As it stands, the 103-minute version of The Promise is not as bad as all that. Some of the negative critical reaction I've seen comes from taking the film too seriously, when it's clearly meant to be a fantasy with absurd elements. The story is a fairy tale, complete with acts of mischievous deities, magical cloaks, and bitter curses. The plot exceeds the normal love triangle parameters, instead being more of a triangle of three male suitors revolving around a single woman. Princess Qingcheng (Cecilia Cheung, One Night in Mongkok) is the object of every man's desire, but due to a childhood pact she made with the goddess Manshen (Hong Chen, who was awesome as Lili in Kaige's Together), she cannot have lasting love. This has caused some animosity along the way, and the evil Duke Wuhuan (Nicholas Tse, Time and Tide) has a long gestating hatred for her that compels him to make a move on the Emperor (Cheng Qian) who harbors her. It is at this juncture that two other characters cross the path of this story. The Master of the Crimson Armor, General Guangming (Hiroyuki Sanada, the Ringu series), is a ruthless warrior. So ruthless, in fact, he has bought several hundred slaves just to sacrifice them to the barbarians his forces are fighting. From those slaves emerges Kunlun (Jang Dong Gun, The Coast Guard), who uses his super speed to outrun the stampeding bulls the barbarians send at the army. Once his victory is in hand, Guangming is informed of Wuhuan's attack on the Emperor. The Duke and the General are already bitter enemies, so Guangming can't pass up the opportunity to squash his rival. 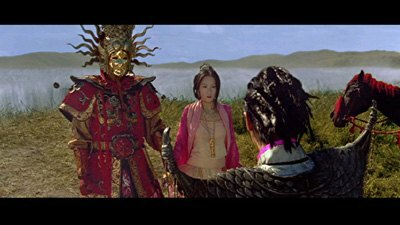 On the way, however, the General and Kunlun are attacked by the assassin Snow Wolf (Liu Yeh, Jasmine Women), forcing Kunlun to put on the General's armor and go to the Palace himself. What happens there is what sets off the rest of the movie. Most importantly, it will mean the Princess will fall in love with one man when she thinks she is falling for another. It's a fun story, full of unabashed romance and incredible flights of fancy. Kaige worked with exceptional production designer Tim Yip (The Banquet) and cinematographer Peter Pau (Crouching Tiger, Hidden Dragon) to create lavish sets and costumes, including glorious sequences atop the Palace, in a golden birdcage, and a truly exciting fight sequence in a room with spinning sections of floors. The Promise is breathtaking to look at, there's no doubt about it. The sequences with the Goddess Manshen, in particular, are jawdroppingly beautiful. In fact, I'd probably say that the movie is better to look at than it is to actually watch, as the story does fall flat at times and runs low on steam as it approaches its ending. Kaige and crew would have to plead guilty to valuing surface over feeling. Ironically, for the visuals being the greatest strength of The Promise, they also provide its greatest weakness. If there is one thing that can almost be universally agreed on, it's that The Promise has some of the worst digital effects to land on a movie screen in a long, long time. For most of the scenes, the CG is so obviously animation, there is no hope of Kaige ever fostering the illusion that any of it is real. 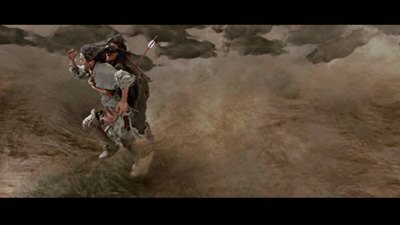 This is most noticeable in wide overhead shots of the Palace or of the battling armies of General Guangming and the barbarians, or when the effects team is placing living actors amongst computer generated objects, such as when Kunlun is running with the bulls. My impression is that this is not incompetence so much as it is an attempt at an over-stylized look gone wrong. If you consider the scenes where the animation works--Manshen meeting the young Qingcheng in the water, or Qingcheng standing on the Palace roof with the sky a splendiferous blue behind her--I think you can see what Kaige wanted to do. He was hoping to amp up the fantastical feeling of his fairy tale, creating a collision of reality and imagination. Only it doesn't have the grace of Jacques Demy's Donkey Skin or the sheer low-fi audacity of Seijun Suzuki's Tanuki-Goten; instead, it's too slick for its own good, its sheen blinding the audience to its true purpose. 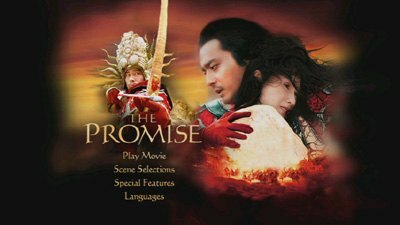 When it comes down to it, I really want to like The Promise more, which is why I am going into the movie at such length here. I'm a big fan of Chen Kaige, and I also really like this type of story. It has adventure, personal sacrifice, and larger-than-life romance. When Qingcheng realizes her mistake and sees the man that really rescued her from the clutches of death, it should have a bigger impact. My heart should break, I should cry, I should really feel it. Unfortunately, by that point, the story has fizzled under the weight of all the glitz. All the characters are too broadly drawn to give the proper emotional charge. So, the question for me seeing The Promise again on DVD after seeing it in the theatre was, after viewing the deleted scenes, was this movie hurt by the cuts forced by the American studios? I have to say yes. While I'm not convinced the full-length film would be a total slam dunk, the missing elements do add depth to the characters. In fact, one of the explanations that runs before a scene with Qingcheng and Wuhuan is flat-out ridiculous in how it tries to explain the decision. The title card claims that the scene was removed because they felt it weakened Qingcheng's character because it shows her trying to seduce Wuhuan, but that's absolutely wrongheaded. It actually strengthens her character, because she seduces him to get him close enough to draw a knife on him, and her subsequent emotional breakdown illustrates how deeply she feels for the man who rescued her. 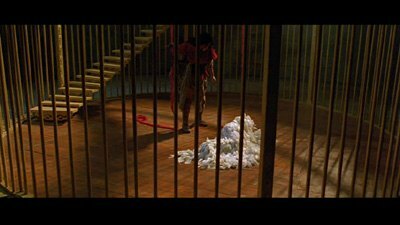 Similarly, there are two moments between Qingcheng and Kunlun that show the slave embracing free will. The character that really suffered from the cut scenes, however, is General Guangming. He has much more complex motivations in the original Chinese version than he does in the butchered cut. There is more interaction with the General and Manshen where the goddess taunts and challenges him, and her intervention goads him into sticking with a particular plan of action. We also see more dialogue between the General and the Princess that adds further nuance to their love affair. In those moments, they fall in love for real, not just out of a convenience of circumstance. While The Promise is likely a deeply flawed film at whatever length you see it at, this U.S. DVD will win the distinction of being the most flawed of all. While this DVD could have fixed the crime done against the picture and given American audiences a chance to see Chen Kaige's film as he originally meant it to be seen, the studio only goes halfway with it. What with all the fake director's cuts and extended/unrated editions clogging the shelves these days, here was an opportunity for an authentic restoration. Oh, well. I guess that's what imports are for. Despite the egregious treatment the film's story has received, Warner Independent does right by The Promise when it comes to transfer quality. This gorgeous film is shown in enhanced widescreen, and it looks wonderful. Both the original Mandarin language track and the English dub are mixed in 5.1, and just like with the picture, it's a fantastic job. Lots of background subtleties really come through. There are English, Spanish, and French subtitles. The English ones are very good. As noted in the main review, there are seven deleted scenes. You can watch them individually or select "play all" to view them all at once. Unlike the main feature, however, they are in full screen. They don't have an English dub, either. A 39-minute "Making of..." feature gives us lots of unadorned footage of the set, including Kaige giving direction to the actors, some green screen use, and the difficulty of filming stampeding bulls. ("The problem is, I don't speak cow," one production assistant notes.) This mini-movie looks like it was made for Chinese television, and as far as backstage features go, it refreshingly eschews the standard back patting. Finally, you can watch the original theatrical trailer for The Promise. Rent It. Chen Kaige's The Promise is as beautiful as it is flawed. While there is much to look at here, the movie often falls short of the mark, both from a visual standpoint and from a writing standpoint, as well. If this DVD contained the original cut of the movie, I would probably recommend it as being worth checking out because its failings are at least born from noble goals; however, the U.S. studio has seen fit to keep their butchered version intact, and I can't support that by suggesting you pay retail for it.